Want to Know the History behind “Today’s” Date? Every day has a history of its own in past. But to know the history behind that date we need to Google to find what had happened on the day in past, at some place in the world. Each day is a milestone in human history. This Day is a web content page, designed by Nikon, that shows what happened on that day in the past, at somewhere in the world. 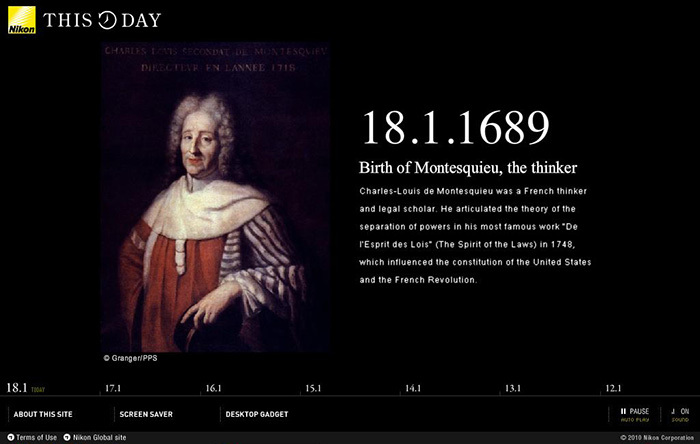 It shows historical events which had happened in past on the same day you visit the site, for instance today is January 18, and I learned in January 18, 1689 Montesquieu, the thinker was born. We all (of any age group) should use this site as the site is very useful to remember the historical events behind dates. Also a nice sound track will never let your mind go to boredom. RTT gives 4.5 stars out of 5 to “This Day”. Thanks snaphow. Great blog man! Can you tell me how you displayed adsense ad rectange below post title? When i do it in my blog, adsense ad code get displayed in the home page with the post summary. If you have done my your own means you read lots of tutorial on it? Its quite simple just you need to follow few simple steps and need to code few lines in your html.